NDX makes a new high. What does that mean? The big question being asked is what’s happening with the NDX. I spent a considerable time re-analyzing the NDX at all degrees to see what insight I might get. All of the Waves up to January 26 were impulsive. So, how could a complex double zigzag fit in? The answer lies in the fact that a Wave (B) may exceed the length of its corresponding Wave (A). So, while the SPX and DJIA are still making lower highs, the NDX may simply be giving a non-confirmation top. There is a precedent for this. In January 2000 the DJIA made its top at 11750.20 while the NDX did not make its high of 4816.24 until March 24. However, 17 market days later the NDX was at a low of 3107.42 (35.5% lower). The point of this is that we may be expecting a severe low in approximately the same time period. Should the market break today, we may see an even larger decline with a potential low between March 21 and March 28. 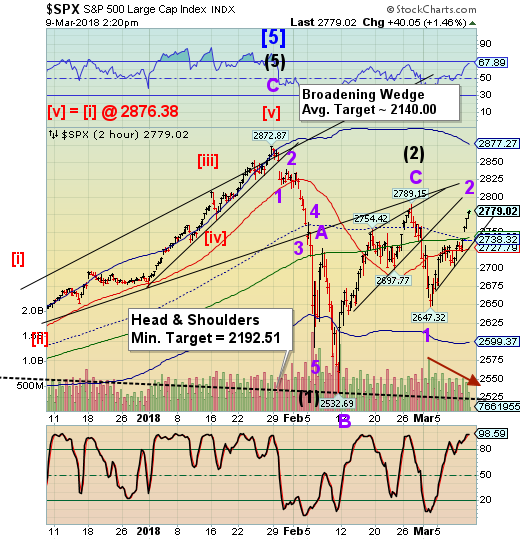 SPX appears to have made a double zigzag Wave 2. 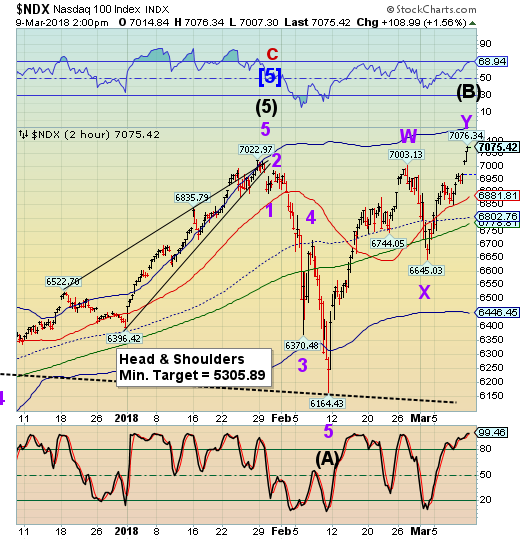 Although it is not my favorite formation, it fits the current scenario that Wave (3) may have already begun in the SPX. ZeroHedge reports, “Add one more paradox to a market that seemingly refuses to follow any logic. In a week in which the S&P did not suffer one down day despite the "Cohn Gone" scare and Trump's trade war announcement, US stocks suffered "massive" - in Reuters' words - outflows, according to BofA analysts and EPFR data, which found that investors rushed into government bonds and other safer assets. 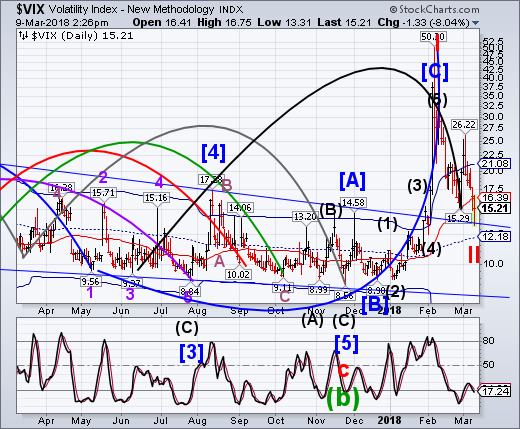 VIX tested the Ending Diagonal trendline this morning and has been above it, since. It may be a very appropriate bottom for a Cycle Wave II. TNX rose as high as 29.14 this morning, putting it in the “danger zone” for stocks. The shape of the bounce was an a-b-c pattern, which makes it uncertain which direction it will go, sonce it could be either a Wave [b] or the beginning of an Ending Diagonal rally higher. As mentioned earlier, we must see a break in either direction to know what we are dealing with.